I wish everyone a happy, healthy and prosperous New Year. See you in 2003. While the origin of the term “swizzle stick” is less than completely clear, they are drink stirrers, usually made of plastic, which used to be available in virtually every bar. They often promoted brands of liquor, but they also bore the logo of the place serving the drinks, be it a hotel, bar, or even an airline. They are more difficult to come by these days now that bars often use those awful little, thin plastic straws as drink stirrers. Some people, obviously not knowing how silly they look, insist on drinking through those teeny straws. Yo! It’s whiskey, not a milkshake! Next time you are served a drink with a teeny straw in it, I suggest you use it to stir your drink, and then remove it. You might consider putting it in your pocket after each drink as a convenient way to remind yourself when you have had enough. Not surprisingly, people collect swizzle sticks, and I enjoyed looking at the collections here, here, and here. A Hockey Night for a Non-Hockey Fan. Last night I went with a friend to Continental Airlines Arena to watch the New Jersey Devils play the Washington Capitals. The tickets for the event came courtesy of my friend’s employer. No one I know would describe me as a sports fan, much less a hockey fan, but I have been to New Jersey Devils hockey games a couple times over the years (also with corporate tickets), and I attended this time, because it is difficult not to get caught up in the spectacle of it all. It starts in the parking lot being surrounded by the tailgaters, ranging from folks who bring a sandwich to eat and a beer to drink before the game, to those who set up elaborate cooking areas and bring cases and cases of pre-game suds. Last night, we enjoyed it all vicariously, as it was below freezing and the thought of standing in the wind-whipped Jersey parking lot sipping a cold one didn’t appeal to me very much. So, we left the tailgating to the diehard Devils fans. Once in the Arena and its large circular hallway, one is treated to another people show, the cast of which hustles in both directions simultaneously. I immediately began to think that I was the only person in the place who was not wearing some sort of Devils regalia. People were wearing Devils hats, Devils jerseys (adorned with their favorite player’s name and number), Devils Jackets (one guy was sporting a leather job that must have cost a small fortune), Devils Sweaters, Devils tee shirts, and a couple guys even wore Devils hardhats. The prize for the goofiest, I think, goes to the people who wear red devil’s horns on their heads that blink on and off. Some people carried homemade “Go Devils” signs, and a few even painted their faces to say, I assume, “Go Devils” (I found it difficult to read the face writing without staring directly into the faces providing the writing surface, something that made me, if not them, uncomfortable). The circular hallway is also full of places that sell all sorts of food and drinks, including beer and I think even booze. The Devils Fan Club also mans a table, as do program sellers, and people who were taking applications for Devils Visa Cards (all the way up to platinum), which come with a free three-month subscription to Sports Illustrated Magazine. Of course, there were also numerous souvenir stands selling a dazzling array of Devils hat, jerseys, toy hockey sticks, and God knows what else. It was all flying by too fast, as I was working my way through the crowd to find our seats. Upon exiting the circular hallway, one enters the seating area surrounding the rink. It is a case of an instant and pleasing audio and visual overload. All the arena lights are ablaze clearly showing the advertisements and corporate logos that cover seemingly every inch of the interior. Even the ice itself serves as a billboard displaying the “Bud Light” Logo under the playing surface. There are several huge TV screens on which there is always something (almost always promotional) going on. Both teams were in full force on their respective sides of the ice warming up by skating in all directions and slamming dozens and dozens of pucks to one another and at the team’s goalie. The goalies’ functional, protective outfits are also billboards for the teams’ colors and, with their elaborately painted facemasks, they look downright otherworldly to the uninitiated. The sound of it all is also quite amazing. As the teams warm up, one can hear the multiple thwacks of the pucks hitting against the sticks as well as the noise of the skate blades cutting through the ice and against it as the players abruptly stop and change direction. Now and then a practice shot smacks into the glass (protecting the audience members from possible decapitation), which creates a sound that leaves little doubt about how fast those things fly through the air. All this is against the background of electronic music that is pumped through a well-equalized sound system that must be worth a gazillion dollars. During the game’s many breaks in play, the action does not stop. There is a person dressed as a devil who shoots tee shirts from a special gun that can rocket tee shirts from ground level to the highest points in the arena. There is also a “Winning Section” game, which awards a single row of audience members, chosen at random, prizes that are handed out by the tee-shirt shooting Devil guy. The huge TVs also fill in the play breaks with entertainment. For example, there is the “Kissing Cam” that focuses on two unsuspecting audience members for all in the arena to see. If they kiss, they are rewarded with applause, while refusals to smooch bring hoots and hollers from the audience. . Much like the “Kissing Cam,” there is a also a “Fan Cam,” which focuses on one or more fans who are the most creatively “Deviled Out.” Last night one of the favorites turned out to be an infant decked out in a pint-sized Devils jersey. The TV also entices audience members to visit the souvenir stands in the circular hallway during the intermissions, and informs parents that while out there the kids can have their picture taken with Scooby Doo (who looked to me to be about 6 and a half feet tall). It was quite an amazing experience, but there is most definitely a rub, and that is, I cannot imagine too many families of four being able to afford to experience the whole show. Here are some numbers. Tickets. Our tickets carried a price of $90.00 each. We sat in Section 117, which are very good seats, but one could pay more for even better seats. So, for Joe Working Guy, his wife and two kids, the seats alone would cost $360.00. Parking. Our parking was included with the complimentary tickets, but parking normally costs $10.00. Drinks and Food. If the parents might like two beers each during the evening, they come at $6.25 each (a can of Coors Light in a plastic cup), and the guy serving the beer has a tip jar. So, figure another $26.00 for beer. For kids, soda or milkshakes run about $4.75 each. If each child wants two, that’s another $19.00. Food is also extremely expensive. I don’t know about the fancier food items, but a couple pedestrian hot dogs can run $10.00. Two for each family ember totals up to something like $40.00. Toss in some fries and popcorn and you’re easily up to $50.00. (I saw dads carrying lots and lots of food and drinks). Souvenirs. Let’s assume that the adults are not interested in souvenirs (although you could not prove that by watching the action at the counters), and that only one of the children wants a jersey, while the other wants only a hat (anyone with kids knows that this is a pretty gutsy assumption). The jersey will run about $70.00 and the hat about $30.00. So, conservatively, it would cost a family of four something in the area of $555.00 for a night of Devils Hockey (not including a program, the Devils Year book, or the picture with Scooby Doo). Now, I am sure that it can be done cheaper. Cheaper seats, no food, no beverages, no souvenirs, no this, no that, – an evening of “no’s” to the children. Pretty sad picture, I think, and the people who are making all the money count heavily on that. I am sure that sports journalists have a good deal to say about why it is that professional athletic events are becoming something that only well-to-do individuals and corporations can afford, so I will leave that to them. For my part, as much as I enjoyed the evening, I think for $555.00, a family could get more bang for the buck elsewhere. However, I am sure that the folks wearing the blinking horns on their heads would not agree. Oh yeah, the game was very good. The Devils won 2 to 1 in overtime. Bill and Ted’s Excellent Adventure Christmas. On November 28, 2002 in “More than Just Turkey,” I shared our family’s custom of selecting an annual theme for grab bag gifts at Christmas. As reported then, this year’s theme was “Bill and Ted’s Excellent Adventure Christmas,” inspired by the movie in which two spaced out high school students manage to go back in time and witness historical events. As such, each participant in the grab bag had to purchase gifts that collectively signified an historical event. It turned out to be more of a challenge than any of us realized at the time. Of course, my putting the grab bag gift out of mind until the last minute did not make things easier. Event. Ben Franklin’s experiment proving that lightening was an electrical phenomenon. Gift. Small globe, toy soldiers, “Uno” game. As in the past, we had lots of laughs, but we all agreed that, by comparison, the Elvis Christmas was a snap. Last night I watched the History Channel’s re-broadcast of The World Trade Center Special, which included dramatic photographs and video clips of that horrible day in 2001. The re-broadcast was every bit as unsettling this time as it was the first time I saw it. I think the History Channel should broadcast that program several times per year, and I think we would all do well to watch it each time it airs. Slightly more than 15 months have passed since September 11, 2001, and, judging by what seems to occupying people’s minds and the collective mind of the press, I wonder if we are letting those horrible pictures slip away from our consciousness. It seems to me that far too many people are far too concerned with who their favorite “Survivor” is or what is the latest disgusting thing people will have to eat on the “Fear Factor” to get their 15 minutes of fame. Those who consider themselves too sophisticated to wonder who will booted off the island or who will actually be able to gobble down all their allotted number of reindeer testicles, spend far too much time worrying about which Senator made what lame-brained remarks in any given week. There are people in world, cut from the same cloth as the 9/11 terrorists who, given the chance, would happily kill you and me and our children simply because we are Americans. Their willingness to kill us knows no political parties. They hate democrats, republicans and independents alike. Carrying peace signs (as if you have a monopoly on wanting peace) won’t get you a pass from them. They hate you too. They do not distinguish between military and civilian targets. We are all their enemies. They don’t mind dying in the process of killing you and me and our children. This all seemed quite clear on September 12, 2001. I worry that we are forgetting what we must never, ever forget. And if you are one of the American-brought-this-on-itself crowd, consider this a cyber spit in your eye. I suggest you consider living elsewhere. Try Saudi Arabia on for size. I hope everyone had a Merry Christmas. I certainly did. Lots of great, fattening food (guilt free – It’s Christmas) and more than a few Christmas libations, which mad shoveling snow today a special treat. I think I’ll use the balance of this day to mentally and physically regroup. This is the time of year when people, like me, who drink champagne once or twice per year find themselves wanting or needing to buy some Champagne for Christmas or New Year’s Eve. Large liquor stores will often have a large and varied selection of the bubbly, which can be terribly confusing, with prices ranging from $4.95 per bottle to twenty times that much. If you found “Holiday Spirits, the Drinkable Kind” (December 16, 2002) useful, I thought you might appreciate a Champagne recommendation that will not bust your budget. I recently tried and thoroughly enjoyed Mirabelle Brut (dry) Sparkling Wine from the Shramsberg Winery in California. For about $12.00 – $14.00 per bottle you can serve “Champagne” that should please all but the $100.00 per bottle folks. If, however, you feel that you absolutely must have French Champagne, I recommend Moet & Chandon. It is excellent, but it can set you back $35.00-$40.00 per bottle. For a New Year’s toast, I’d go with the Mirabelle. A tip on opening Champagne. Champagne should not gush from the bottle upon opening. Gushing Champagne just means that the person opening the bottle did it incorrectly, or he just won the Indy 500 and wants to spray Champagne rather than drink it. When Champagne is opened properly, you should hear a soft “pop” as the cork comes out of the bottle. I prefer setting the bottle on a flat surface, as it allows you to control the cork and bottle better. The key is to firmly grasp the cork with one hand (best to use a towel) and TURN THE BOTTLE, not the cork, with the other hand. You will find that when you do this, you will feel the cork push itself slowly out of the bottle. Here are detailed instructions, with photographs. I was in the Army only about a week or so, and there I was being accused by the First Sergeant of cheating on a test. One must understand the terrifying power of a First Sergeant. The First Sergeant is the highest ranking non-commissioned officer in a training company, and most definitely is not a man to be trifled with. First Sergeants usually have twenty years plus in the military, and they have been known to make young officers shake in their boots. Here’s what happened, and I believed then and I believe now that it could only have happened in the Army. About a week or so into Basic Training, each man in the training company was given a three-hundred-question multiple choice test to take cold. The test dealt, quite predictably, with Army things (e.g. rank insignia, protocol, drill, communications, weapons, etc. ), but it also dealt with the kinds of things that one learns in the Boy Scouts (e.g. camping skills, survival skills, and first aid). So, as a result of having been a Boy Scout and also having done some pre-induction reading about the Army (that too was probably spawned by the Boy Scout Motto “Be Prepared”), I scored something like 200 out of a possible 300 on the test. Other members of the company, presumably not having been Boy Scouts and not having done any pre-induction reading, generally did not do as well. The First Sergeant did not accuse me of cheating at that time, but he was quite incredulous as to how a “raw recruit” (pronounced something like “rawCROOT”) could score so well. He asked me in front of all the men in the company how I managed what to him was an amazing feat. He was not happy when I told him that I had “learned a lot of that stuff in the Boy Scouts.” I suspect that he probably was a supporter of the Boy Scouts, but he did not appreciate the rest of the men laughing at the implication that this rough-tough Army stuff was the stuff of Boy Scouts. After this less-than-pleasant interlude, other training sergeants spent three plus hours using the test as a teaching tool. They slowly (very, very slowly) read each question and then gave the correct answer from the four choices, along with a brief explanation of the reason for the answer. They did this 300 times. For the 200 questions I had known the answers to, this was frightfully boring, but for the other 100, I paid attention to the answers and the proffered explanations. Now, I swear that the following is true. Twenty-four hours later, the sergeants handed us the SAME TEST. I thought, there must be some catch. This cannot be the same test that we went over in excruciating detail yesterday. But, ten or fifteen questions in, I realized that this was, in fact, the same test. Following completion of the test (actually a re-test), papers were exchanged for grading, and the sergeants again did the same read-the question and then give the answer routine. I could not believe that they were going through this painful exercise a second time. I had assumed that virtually everyone who had heard the answers a mere twenty-four hours earlier would get all 300 correct. Well, the guy’s test I marked got about 150 of the questions wrong!! Incredulous, I concluded that the guy must have been elsewhere the previous day. Wrong. He was there; he had had taken the test and also sat through the three hour tortured review of each and every question twenty-four hours earlier. The other recruit confirmed that he had carefully marked the test. “Something’s going on here,” the First Sergeant hollered. “Whose paper is that?” At this point, I was hoping against hope that it was NOT my paper, and that I had had a series of mental lapses during the test, causing me to get 15 wrong. 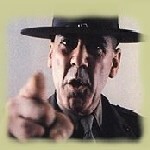 I did not need another exchange with the First Sergeant. The other recruit answered with my name. The other sergeants, who were present during the test, caucused with the First Sergeant and must have assured him that they had not seen any evidence of cheating. During this time, I was thinking, Cheating? You must be out of your mind. What the Christ am I doing here? Perhaps sensing the loss of some ground in front of the entire company, his mood changed yet again to one of conciliation and even grudging admiration. He told all the other recruits that my “outstanding” (another favorite Army word) performance was something they should seek to emulate. This was not the only time I bumped heads with the Army over tests. But that’s a story for another day. It was freezing cold that night in December 1968, when the bus delivered us to the U.S. Army Reception Center in Fort Dix, New Jersey. We were “greeted” by an Army sergeant, who boarded the bus and wasted no time reminding us that we were all “in the Army now,” and that we should all keep quiet and walk single file into a large, sparsely furnished, overheated room for the purpose of filling out stacks of forms. No question about it. This guy did not like his job, nor did he much like any of us. Then and there I decided that if in one of the dozen or so forms yet to go I mistakenly put my first name first, I would not fess up. No, I would take the easy way out and jab my gott-damned eyes out with the gott-damned number 2 pencil and hope for a gott-damned looney tunes discharge. After all the forms were finally completed, we were led to the “mess hall” for some “chow.” (The Army just springs these new words on you.) One thing about the Army — you WILL get three “squares” per day, hence the 24-hour operation of the mess hall in the Reception Center to accommodate the streams of incoming draftees needed to fuel the war in Southeast Asia. Amazingly, some guys greeted this news warmly. I was much too miserable to be hungry. Good thing too, as we were given about five minutes to eat some really chewy chicken wings and lima beans. “Move it. Move it. Move it, gentlemens. Chew it here, swallow it outside, and digest it later!” Maybe I should just jab the gott-damned fork in my gott-damned eyes. As ordered, we all put on our newly “issued” Army underwear under our civilian trousers. Army underwear (or skivvies) are funny looking billowy white boxer shorts that almost touch the wearer’s knees. After a quick trip back to the mess hall (remember, three squares) for a warp-speed breakfast, we were “marched” to the barber, where in approximately 20-30 seconds, each of us was relieved of a critical part of our 60’s identity – our hair, just about all of it. The barbers were ankle deep in the stuff – just another surreal picture. Everyone looked perfectly ridiculous, but, more importantly to the Army, everyone looked sort of the same. The next stop was a long, long building where we would be issued uniforms. The idea here is that you start at one end of the building in your underwear and you exit the other end of the building with a uniform on your back and a duffle bag full of extra clothing. Army efficiency at work. So, when we entered the building, we were told to remove everything except for our newly issued Army shorts (I believe that our civilian clothes were mailed home, but I do not recall). From there, we were led into another large room, with rows and rows of folding chairs arranged in front of a stage. We sat shivering in our Army shorts while one of two sergeants on the stage began to tell us how the uniform issuing procedure would work. In mid sentence, he was interrupted by the other sergeant, a huge black man, who pointed out into the audience and shouted, “YOU! !” Sweet Jesus, does he mean me? If he means me, I hope I just have a heart attack and die right gott-damned here. “YOU!! YOU IN THE BACK!! !” the sergeant roared. “Me?” the guy in the back said. “Yeah, YOU!!! Get the f*** up here!” Thank God it’s not me. It did, however, turn out to be a guy I went to high school with – a seriously smart, exceedingly polite and quiet guy who had recently graduated from a prestigious university. I was horrified for him as he walked, like a condemned man, to the stage in his shorts and nothing else, past the 100 or so of us, also in our shorts and nothing else. Frightened, and obviously puzzled by the reason for the question, Carl said, “Where am I from?” Oh God, he repeated the sergeant’s question. Carl looked down and saw, to his shock and embarrassment,. that he had indeed put his underwear on backwards. He was speechless. We all stifled our laughter, as we quickly looked down to make sure that we didn’t put our bed sheet sized underwear on backwards. No one, but no one, laughed as Carl, right there on the stage, took off his shorts, turned them around, and put them back on. About an hour later we were all at the other end of the building wearing olive drab everything, very drab indeed. It all served to remind me of just how much my life had changed in not even 24 hours. It would become even more bizarre, but that’s a story for another day. My cousin Jack wrote me after having read Musical Altercations (see December 17, 2002), a piece envisioning how the stories told in the lyrics of songs involving fights would look if reported in the press. He remembered a song I had not considered. Even though the song does not actually involve a fight, it does play on the theme of a stranger making a pass at a jealous fellow’s wife/girlfriend (e.g. “”Bad Bad LeRoy Brown” and “Copacabana“). Here, however, the protagonist wisely escapes before being stabbed, slashed, shot or beaten..
TIJUANA, Mexico — Restaurateur Bad Man Jose reported to local police that a patron of his cafe near the U.S. border ran away through the window today without paying a sizeable food and bar bill. The unidentified patron bolted suddenly following a brief altercation involving Jose’s wife, who also works at the establishment. Police said that although the mouth-watering food at Jose’s is a major tourist attraction, there have been increasing reports of trouble caused by overly aggressive male customers. Jack regularly writes about music from this era in Yakety Yak. Be sure to check it out.